The benchmarks of the wine world come in many forms—a region such as Bordeaux, admired for centuries; a much-loved grape such as Pinot Noir finding new expression in an emerging terroir; a family winery leading an ancient country to modern success. Bordeaux 2016: A free chart offers an alphabetical list of all Bordeaux 2016 wines reviewed for the tasting report in this issue. Oregon: A free chart offers an alphabetical list of all Oregon Pinot wines reviewed for the tasting report in this issue. Bringing Change in Spain - Moved forward by five generations of the Torres family, the namesake wine company has evolved from a modest Catalonian bottler to an industry colossus, with more than 30 brands and thousands of vineyard acres. Along the way, Torres has lifted the reputation of emerging Spanish regions and inspired good practices in the industry. WineSpectator.com: VIDEO: Fair Trade Wines, Building Community: Miguel Torres Jr. explains his commitment to Chile and Fair Trade. FREE: Bordeaux 2016 Alphabetical Listing - More than 585 wines were reviewed for this report. WineSpectator.com: Members can access complete reviews for all the wines tasted using the online Wine Ratings Search. WineSpectator.com: 2017 Bordeaux Barrels: James Molesworth visits top estates and rates 250-plus wines. FREE: Oregon Alphabetical Listing - More than 560 wines were reviewed for this report. WineSpectator.com: Exploring Wine with Tim Fish: Our lead taster for Oregon has lots more to say! 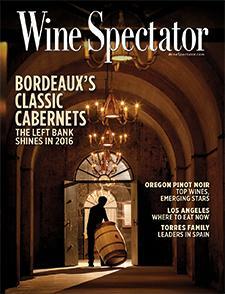 WineSpectator.com: Members can reference our full archives of columns and other articles about spirits. WineSpectator.com: What's On Our Minds? : Our editors discuss trends and their latest discoveries. WineSpectator.com: Find out more about this intriguing pairing—and get the recipe from executive chef João Dias of Ferreira Café in Montréal. Get it for free and watch a video clip about the pairing. WINE & HEALTH In "Top Health Topics of 2018" we share the past year's biggest news and most provocative questions regarding moderate drinking and its role in brain health, aging, diabetes, cancer and more. Keep on top of the latest research with our regular Health News reports, ask questions in Wine & Health Q&A and sign up for Wine & Healthy Living, our twice-monthly e-letter. VALENTINE'S DAY We're sure your darling will be impressed when you whip up a recipe from a top chef, present the perfect wine pairing and wrap up with a delicious dessert. We've got everything you need to make this romantic day a success. And if dining out is more appealing than dining in, be sure to choose a restaurant with a Wine Spectator award-winning wine list. NEED-TO-KNOW NEWS For wine lovers and the trade, WineSpectator.com is the place to go to find out which big-name wineries have been sold, how the Supreme Court might impact wine shipping laws, the latest in wine crime, and much more. Keep up with our News section or follow us on Twitter or Facebook. A Perfect Match: Chocolate Mousse with Tawny Port: Find out more about this intriguing pairing—and get the recipe from chef João Dias of Ferreira in Montréal. 2017 BORDEAUX BARRELS Want even more Bordeaux coverage? Get James Molesworth's scores and tasting notes for more than 250 red, white and dessert wines from the 2017 vintage. Plus, read his dispatches from first-growths Haut-Brion, Lafite, Mouton, Margaux and Latour, Right Bank all-stars Pétrus and Cheval-Blanc, and more. SEARCH 383,000+ WINE REVIEWS We've hit a new milestone in our online library of expert wine ratings! Use our powerful search to find the latest scores and tasting notes (we blind-tasted more than 15,000 wines in 2018 alone), check the recommended drink window and latest auction prices on your cellared wines, or delve into the historical performance of the world's great collectibles.